Some plants rely on just one or a few related species to pollinate them. In this case, there has usually been coevolution between the plant and its pollinator – evolutionary changes in the flowers directly cause evolutionary changes in an insect, and vice versa. Having a specific relationship ensures even more precision in pollination, so the plant can be “sure” that its pollen will be delivered correctly. Here are some examples of plant-pollinator pairs that have coevolved. Some plants with extra long corollas are pollinated by specific Lepidoptera species with long proboscises. Refer to the online article “Resource Competition Triggers the Co-Evolution of Long Tongues and Deep Corolla Tubes” for details. Only the moth or butterfly with the longest proboscis in the area can pollinate the flower, ensuring specificity, and excluding general pollinators with short proboscises which may not deliver pollen to the right place. 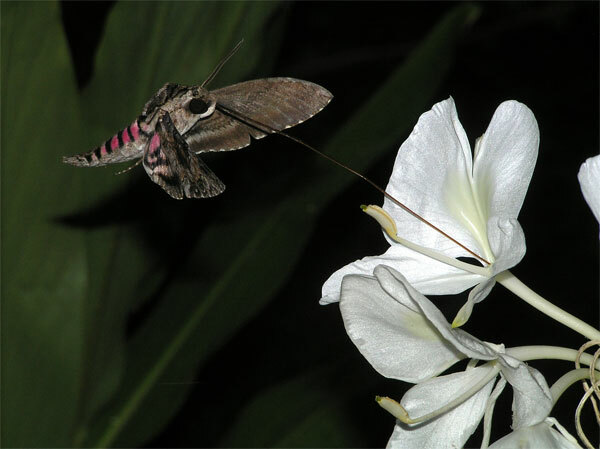 Figure 7.53: The moth shown above is able to pollinate flowers with long corollas due to its long proboscis. In some flowers, such as those of tomatoes, the pollen can only be removed from poricidal anthers (anthers with a small hole) via a bee buzzing them at the correct frequency. Refer to the article “Buzz Pollination” from BayNature.org for details. This behavior and ability is specific to particular bee species (not honeybees). This prevents bees who will not properly pollinate the plant from getting any pollen from it. Click here to see a video of this behavior on YouTube.com (video will open in a new window). While various species of orchid bees (euglossine bees) do collect nectar and pollen from orchids, in some cases orchids have evolved that do not produce nectar, but instead attract males with essential oils that males collect and convert to pheromones that the males use to attract females. During the process of collection of the oils, the orchid attaches a pollen mass or “pollinium” (plural “pollinia”) to the male bee, which deposits it on the next flower. This may be the only group of bee pollinators for which males are targeted by flowers (usually females go to flowers to collect pollen to feed their offspring). Male orchid bees can be collected in tropical regions by soaking filter paper in certain essential oils (such as oils of cloves or wintergreen) and tacking it to a tree. 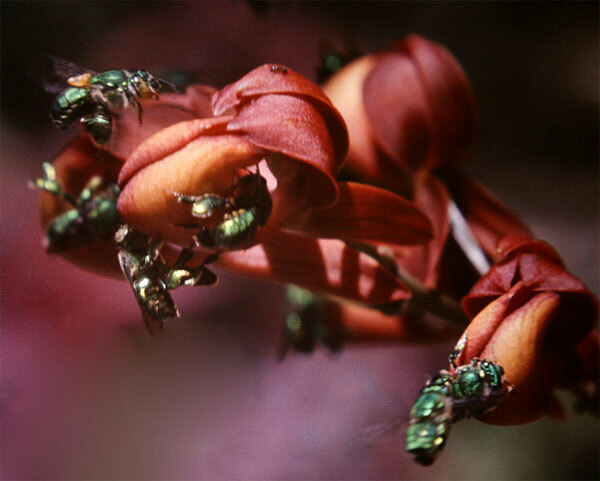 Figure 7.54: Male orchid bees at orchid Mormodes buccinator. Every species of fig tree is pollinated by a specific species of fig wasp. Refer to the article “How fig trees are pollinated” from figweb.org. The extreme dependence of the fig tree on its wasp pollinator is demonstrated by the fact that its flowers never open; the fig wasp has to go into the fig to pollinate it and lay eggs. When the eggs hatch, larvae eat the fig and develop into adults. Female wasps mate with their brothers and escape through a tunnel in the fig dug by the males, flying off to start the cycle again by laying eggs in another fig. Click here to see a short video on YouTube.com showing part of this process (video will open in a new window); the wingless male wasps never leave the fig after hatching. 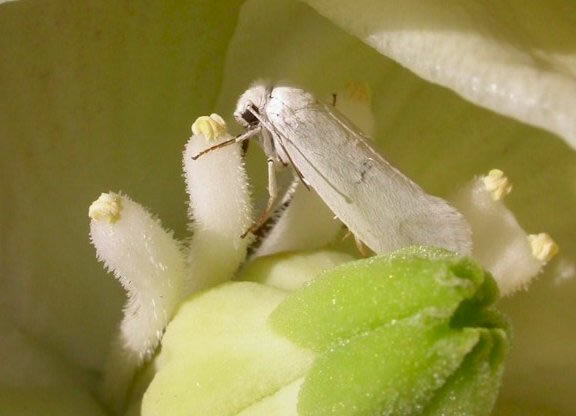 Similar to fig wasps, yucca moths are specialist pollinators for yuccas. Click here for more detailed information. Female yucca moths pollinate the yucca in order to provide food for their larvae, which eat the seeds of the yucca in order to develop. Some seeds are left uneaten, so that the plant still benefits from the relationship. Figure 7.55: A yucca moth. In this system there are also cheater moths who lay their eggs in a flower after it has been pollinated. Their larvae gain the benefit of the seed food source, without the moth helping the plant to reproduce – in fact, in yucca fruits that have been invaded by cheaters, all the seeds are often eaten, so that the yucca cannot reproduce.